 Nigerian Nobel laureate Soyinka offers more than 30 years' worth of rewarding essays on artistic practice and cultural politics. While he is best known in America as author of the memoir AkÇ: The Years of Childhood (1982), Soyinka first made his name as a dramatist, and many of the writings collected here concern dramatic art. These include the opening essay, which expresses Soyinka's dismay with his national theater; a longer piece, written 20 years later, that surveys modern versions of traditional West African theatrical forms; and extended considerations of Aristophanes, Euripedes, and Shakespeare. Soyinka's intriguing discussions of literature and myth include a theoretical reflection in which he forges a Nietzschean model of Yoruba tragedy, centered on his vision of ``the fourth stage, the vortex of archetypes and home of the tragic spirit.'' Most of his essays here, however, focus on broader issues of African society in the world context. In early efforts, he sensitively explores the implications for African writers of the ``common backcloth'' of primitivism against which European commentators have depicted them, yet upbraids his fellow Africans for abdicating their political responsibilities in the wake of decolonization. Later essays call for the dissolution of language boundaries through the adoption of a common African tongue, and for ``a definitive end to all forms of dictatorship on the continent.'' In perceptive essays on Western culture's ``novelty system'' and on Roland Barthes, Soyinka considers the role of the critic in society while working out his ambivalent relationship to Marxism. 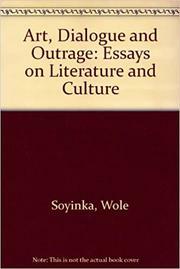 Soyinka's prose can be murky, and too often his ``dialogues'' with other writers amount only to obscure polemics. But while some passages may seem belabored or dated, the insight and outrage that animate the best of these essays remain salient. Soyinka's voice is indomitable, and his perspective unique; his positions should be considered carefully by anyone seeking to join the struggle for culture in the postcolonial era.